Today’s question. What does Jesus have to say about work? Jesus talks about various kinds of work in his parables, but of course the parables aren’t really about work. Jesus warns us about the dangers of loving wealth (Matt 6:24 among other places). Jesus calls us to live a holistic life centered on loving God and loving neighbor. What we’re not given are a lot of specific instructions about appropriate jobs for Christians or how to discern the correct job for us. But I think the story of Zacchaeus offers us some clues. It is important to remember that taxes and tax collection were very different in first century Rome than they are in the United States in our time. Tax collection was a for profit enterprise in ancient Rome. Jews who were tax collectors were considered collaborators with the occupying Roman government by their fellow Jews. Tax collectors were well off, but not well loved. Tax collecting was not considered a reputable job. It was not good work for a Jew. Like other passages in the Bible there are many things to explore and think about in Zacchaeus’ story, but today we want to focus on work. What happens when Jesus comes to Zacchaeus’ house? What is Zacchaeus’ response to Jesus? 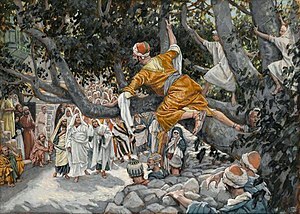 How will Zacchaeus’ way of doing his work be different now? What does this story suggest about the way we do our work, even if society doesn’t approve of or respect our work? Jesus doesn’t tell Zacchaeus to change jobs. Actually in the parable Jesus doesn’t tell Zacchaeus to do anything. Zacchaeus after encountering Jesus changes the way he does his job. He stops being a tax collector by society’s standards and becomes a tax collector by Jesus’ standards- fairly and honestly, making restitution where it is due. While we don’t typically think of jobs as needing salvation, we might use the language of redemption.In this story, not only is Zacchaeus saved, but his job is redeemed. The job of tax collector isn’t abandoned to those without ethics. It is not dismissed as beneath or unworthy of a follower of Jesus. The job of tax collector becomes a vehicle for the glory of God. The kingdom of God enters into the kingdom of Rome and changes it. One tax collector at a time. Can you think of jobs in our society that might particularly need redemption? On one hand we can say all jobs need redemption, but some perhaps more so than others. Are there aspects of you current job that need redemption? How might redemption be accomplished? Is it the result of an individuals efforts? Or the company’s efforts? Or both? How might an individual’s efforts affect a companies ethics? And vise versa? Posted in Bible, vocation/work. Tagged bible and work, Jesus, kingdom of god, Tax collector, work, Zacchaeus. I love that you emphasize following Christ doesnt mean we have to abandon the marketplace.